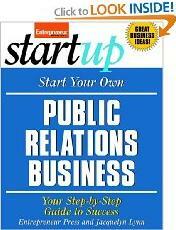 Learn how to set up your own public relations firm, choose your market niche, prospect and sign clients, build media relationships, set fees, and more! Plus, gain priceless insight, tips, and techniques from practicing entrepreneurs and industry experts! The explosion of media opportunities and the rapidly changing communications landscape have served as key drivers for the public relations industry, creating huge opportunities for communications and PR specialists.